UPDATE! - **VENUE CHANGE** - THIS TALK WILL NOW BE HELD AT MAXWELL AUDITORIUM IN SCIENCE CENTRE'S MAIN BUILDING. 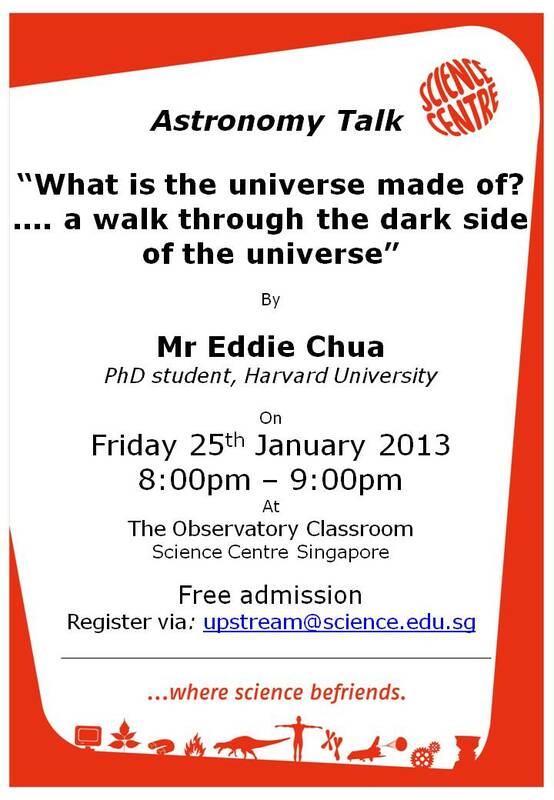 25th Jan 8pm-9pm at SCOB, in addition to our regular Friday night Stargazing. 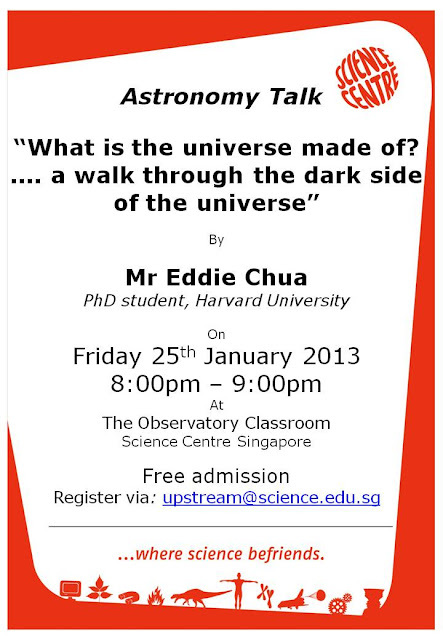 The talk “What is the universe made of? .... a walk through the dark side of the universe” gives an overview of the origins of the universe (big bang), the discovery of the accelerating expansion of the universe (Nobel Prize in Physics 2011), constituents of the universe (dark energy, dark matter + ordinary matter), large scale structure of the universe (cosmic web) as well as a simulation of the evolution of the universe and the formation of galaxies such as our Milky Way. These are not ordinarily encountered in school classes but serve as a stepping stone to get more interested in the science which aids in our understanding of the universe. ...is a second year PhD student in Astronomy at Harvard. He works with Professor Lars Hernquist, using computer simulations to understand the formation of large-scale structure in the universe as well as the properties of galaxies such as the Milky Way.